Three sessions a day: 9h, 14h et 17h. Free transfer (Go & Back) to your hotel. Powerful and well maintained equipment. 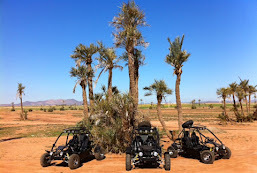 Here is a super 1/2 day to discover Marrakech surrounding and the small mountain of JBILAT! Join us for a walk on the rocky and desert plains in the heart of the palm grove of Marrakech, between the river and the palm groves. Exploring the surrounding Berber villages while enjoying the beautiful landscapes of the High Atlas. Stop at the inhabitant where a tea mint and Moroccan pancakes will be offered! Equipment provided: helmet, hood, windproof (if necessary), mask. Recommendations: closed shoes, long pants, sunscreen, comfortable clothes. Included: guide, vehicle, helmet and goggles, petrol, A / R transfer, water during the walk, tea break at the inhabitant, liability insurance. Not included: tips, extras, personal risk insurance. 1/2 Day at the Lake and Agafay Desert. For nature lovers, for travelers looking for discovery and authenticity, we have for you a sport course at the foot of the High Atlas Mountains. Sports and for all, our professional guides, friendly, attentive and attentive adapt to your levels and take the appropriate tracks in function. 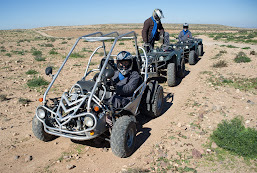 Many landscapes will be offered to you during this course, lake, mountain and desert. 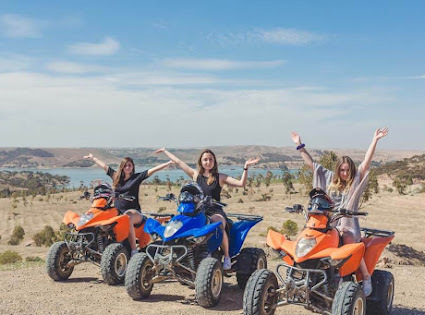 First you will start with the beautiful Agafay desert with its arid hills and rocky desert, then climb steep tracks that lead you through typical Berber villages on the mountainside offering a unique view of the lake. , a breathtaking spectacular view. You will continue your journey with a eucalyptus forest that will lead you to an inn right on the water to relax and admire the light and the sun reflecting on the beautiful Lake takerkoust where a snack will be offered accompanied by the traditional mint tea that you will savor with the snow-capped mountains as a backdrop.